Aston Villa have officially confirmed that Yannick Bolasie has joined them from Everton on a season-long loan deal. As per the club’s tweet below, the 29-year-old will spend the rest of this season on loan at Villa Park and will hope to add a crucial piece to the puzzle for Steve Bruce’s side to successfully mount a promotion push. Last season ended in heartbreak for Villa as they suffered a defeat in the playoff final to Fulham at Wembley. In turn, they’ve had to regroup over the summer and prepare for another gruelling campaign. 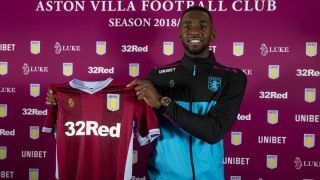 Bruce has already seen the likes of John McGinn and Anwar El Ghazi join up to help with that objective of getting back to the Premier League, and now Bolasie will hope to play his part. The Congo international has previously impressed for Crystal Palace and will relish an opportunity to play regularly and rediscover his best form at Villa after a struggle at Everton since joining the Toffees in 2016. He’s managed just 32 appearances in his last two seasons at Goodison Park due to injury woes and competition for places, and so now this fresh start could be an ideal opportunity for him to get back on track. Particularly with Robert Snodgrass seeing his loan spell end after last season, Aston Villa needed to add more quality and depth in the wide positions. Bolasie will certainly now address that and time will tell whether or not he can play a fundamental role in getting them back into the Premier League. We are delighted to – finally – confirm that @YannickBolasie has joined #AVFC on a season-long loan from @Everton.